For the past 21 months archivist Tom Townsend has been re-cataloguing the Norwich City Archive; a collection of both regional and national importance recording the rich history of the city and one which currently fills nearly 1,000 archival boxes in our strong rooms. The Norwich City Archive was one of the Norfolk Record Office’s founding collections. It is hugely significant, not only because of the importance of medieval and early modern Norwich as a regional capital and centre for an international cloth trade, but also because of the sheer size and scope of the surviving collection. Documenting over 700 years of Norwich’s history from the 13th century onwards, the city records detail the life and governance of Norwich over that long period. Trade was the basis of the city’s wealth, and the city authorities closely regulated trades, tradesmen and also immigrant communities, such as the French and Dutch Strangers, who contributed to the industry of the city. Like all medieval institutions, they vigorously defended their chartered status, rights and boundaries, ever conscious of rival claims from neighbours such as Norwich’s Priory (later the Dean and Chapter), Carrow Abbey, the Abbey of St Benet’s at Holme and the Borough of Great Yarmouth. The city archive also includes the extensive records of St Giles’s Hospital at Norwich (it was given to the city by Edward VI and is now known as the ‘Great Hospital’) from its foundation in 1249, and which have no rival anywhere in the country and were, in 2011, awarded UN status by UNESCO. The Norwich City Records contain a vast range of documents. These include, amongst many others: royal charters and medieval court rolls, early registers or books of evidence of the city’s privileges and rights; records of the various city courts, including petitions to the mayor’s court of equity from distressed litigants, examinations of the accused and depositions by witnesses, case papers relating to particularly notable crimes, the accounts of treasurers, chamberlains, clavors (keepers of the keys of the city chests), sword bearers, chief constables and other city officers, membership lists and inventories of the goods of the Guild of St George; sewer commission minutes and accounts, plans of the city’s estates, rate books, militia muster rolls (i.e. 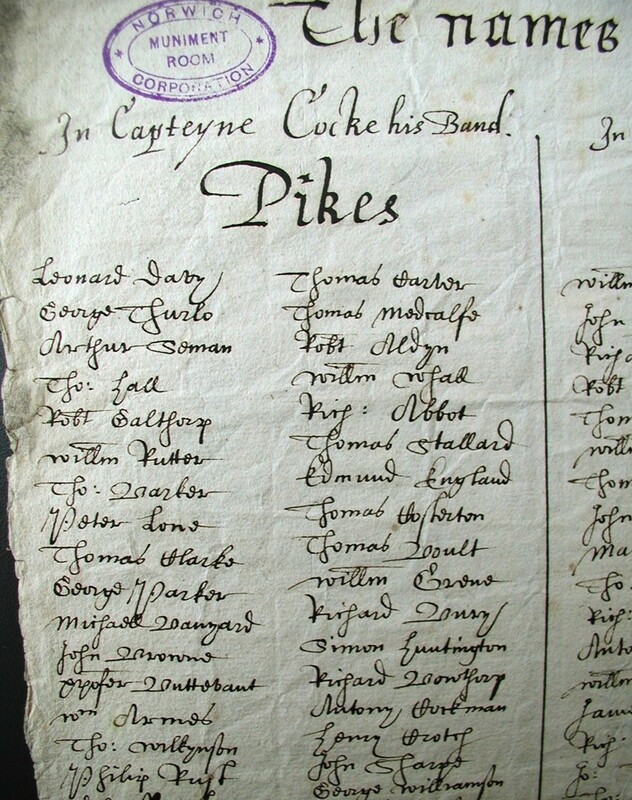 lists of available arms, armour and men), coroners’ inquests; the 1571 census of the city poor, poor rates and parish overseers’ accounts and tonnage registers, detailing the duties paid on goods landed at the two common staithes. If your special interests lie in any aspect of the governance of Norwich, the built heritage (buildings, roads or the city walls), the market place and trade, the people of the city including both rich and poor, the use of the river or the relationship between the city of Norwich and its neighbours then these records are for you. If you interested in how debt and debtors or vagabonds were treated or how crime was punished, details are to be found in the records of the quarter sessions, leet and mayor’s courts. These also record the presentment and punishment of illegal toilets, obstructions of the roads with filth, blockage of city watercourses with muck, overcrowded tenements and the encroachment on city property by opportunistic developers. Then there are trading standard misdemeanours such as those selling corrupt meat or rotting fish, selling short measures or selling goods outside the market place (making it difficult for the city to inspect their goods and premises). The Norwich City Records have been held by the Norfolk Record Office since 1962, but the existing catalogue entries date back to the late 19th century, when the records were inspected and listed as found during storage at Norwich Castle. This created a peculiar arrangement in which archival provenance had little say, and although some key records were described in detail, many were only briefly summarised in series or by their storage containers (cases, shelfs, etc.). As part of the re-cataloguing process, Tom has been bringing the catalogue of the Norwich City Archive up to modern archival standards, generally creating fuller or more representative descriptions and reordering the archive to a form a more coherent set of records. This has involved regrouping and repackaging many of the records. From Tuesday 19th January, Tom will be using some of the Norwich City Records to lead an introductory palaeography course. This ten week course will run at The Archive Centre from 1-2pm on Tuesday lunchtimes and is designed to give participants the confidence to read and interpret any documents written in English from the late 15th to the early 18th centuries. This entry was posted in Behind the Scenes, Events. Bookmark the permalink. Very many congratulations and thanks to Tom for a massive undertaking, and one for which historians and researchers for may generations to come will have cause to be hugely grateful. Thank you for your comments Michael, we are excited about the opportunities the updated catalogue will offer to our users and we hope you will enjoy using these documents in the future.